Falcon JK/JKU Nexus EF 2.2 Fast Adjust Steering Stabilizers offer a wide range of adjustability with its three-position Fast Adjust Knob featuring soft, medium, and firm settings. • The Falcon Nexus EF 2.2 Fast Adjust Steering Stabilizer is also available to fit a HD 1-5/8” (42mm) tie rod (# 01-02-22-110-158). • A non-adjustable Falcon Nexus EF 2.1 Steering Stabilizer is available for the stock 1-3/8” tie rod (# 01-02-21-110-138) or a HD 1-5/8” (42mm) tie rod (# 01-02-21-110-158). 2017 JKU Rubicon with 35's and Mopar 2" lift. 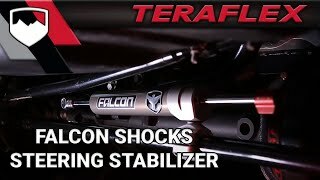 I upgraded from the VSS9550 stabilizer to the Teraflex Nexus EF 2.2. It completely changed the way the vehicle handled. No more nervousness on the freeway, no more constant correction from every little road imperfection or wind buffet. It made a huge difference. For my setup the "medium" setting works best all around. "Firm" was a bit stiff to steer in neighborhoods/parking lots and required a bit of effort at highway speed. "soft" was a big improvement over the original stabilizer, but medium was the best for highway use. Off road "soft" is going to be where you want to be to get that little extra feedback back through the steering wheel. If you have any doubt about forking over the change for this, don't. Just do it.